After spending the week in Nice and soaking up the sun, I packed up the sunglasses and put on the beanie. The travel day to Pontchateau covered all modes of transportation. From the plane up to Nantes, to the bus from the airport to the train station, then a train to Savenay and another bus to the village of Campbon. It was a long day, but it gave time for Becca and I to catch up on our respective vacations in the sun. We woke up on Saturday morning to scattered clouds and Belgian-esque conditions. Corey Coogan-Cisek (Amy D Foundation) along with Denis & Jo from Cyclocross Custom had joined us on Friday night to add to the fun. Becca, Corey, and I pedaled over to Pontchateau to get a look at the parcours and ready ourselves for the races. The track in Pontchateau was almost the opposite of any of the courses I had raced in Europe. Fast, flowing corners provided plenty of room to carry speed. 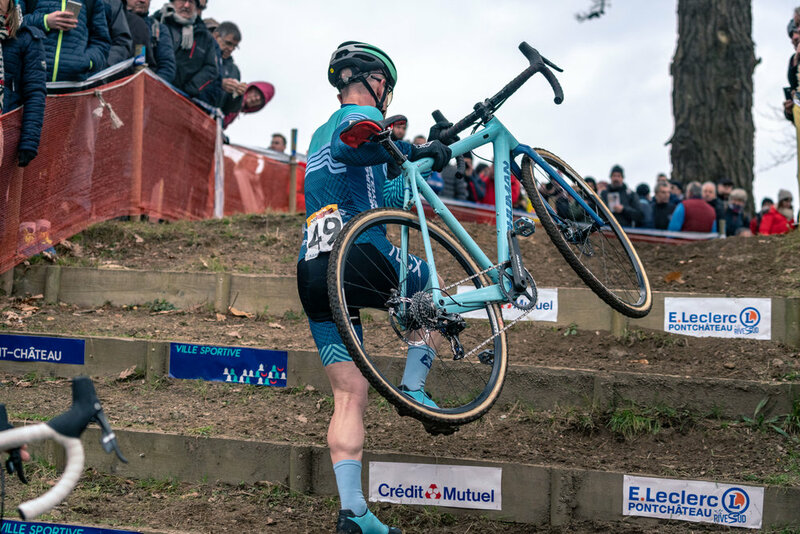 The technical sections weren’t quite as extreme as the course in Brussels or the drops of Namur, but they were so fast you needed to be on your toes and off your brakes. Thankfully the ground was not muddy and by the time we got ready to rip, it was tacking up nice. Pretty sweet conditions to get back to racing after a few weeks off. To add to the excitement, my Aunt Stephanie, Uncle Eric, and cousin Nathan made the trip to France for the weekend! It was a very last minute trip for them, but I was thankful and excited to have them at the races. The whistle blew and the race started full gas. The pavement stretch was so long that I sat down at least two separate times before we hit the first grass turn. Off the stretch I was a bit tentative and found myself at the back with nowhere to go but forward. We made our way through the opening sections of turns and drops before hitting the second set of stairs at the lowest part of the course. From there, the track went up. Body doubled over the handlebars, I pushed on the pedals to stay in contact with the group, and then redoubled my efforts as we made the push towards the barriers. That was probably the slowest I’ve ever done barriers as we reached the first plank in a state of hypoxic exhaustion before unclipping and stumbling over the barriers. I’m still not sure how the leaders were hopping them. With one lap down, I was in a good group and feeling comfortable. But somewhere along the way I lost the wheel and a gap opened up. Riding in no man’s land, I was pushing as best as I could on a fast course. While I was thankful the track was dry, it was so fast that you felt like you were on the gas for the entirety of the lap. 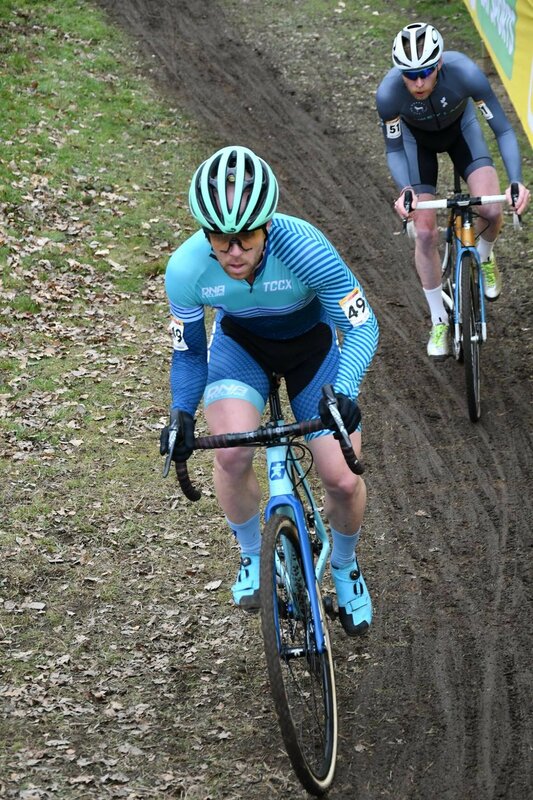 Some may call it a grass crit, and the course design was the most US-like track I’ve ridden in Europe. But there was little to no coasting along the way. I was eventually joined by my US compatriot, Josh Bauer (Donkey Label). Josh and I did battle at quite a few races a few seasons ago. Back in the same race again, there was something both comforting and familiar about racing against each other, even if it was at the back of the pack. All around the course, the fans were cheering. The atmosphere was amazing and it seemed like the fans were interested in our little struggle, far behind the leaders. While Josh and I are friends, between the tape we were racing. With what would be three laps to go, Josh put in a dig to open up a gap on me. I let him go, subconsciously hoping the officials would end my suffering, but I was left to soldier on and eventually caught back up to Josh by the time we reached the pits. Heading back towards the barriers, I put in my own effort, clawing up the hillside and prying open a gap to my friend/ foe. I thought for sure that lap would be our last, but as we rounded the corner, we were in for one more ronde. Josh was now the one pulling me back and despite being locked in battle, we both had a smile on our face. We summited the rideable stairs and as we dropped into the small whoop section, the crowd was unlike anything I had ever experienced before. Lined three deep on either side with the flag of Brittany placed perfectly above the peak of the hill and the fans eagerly awaiting every rider to “Send It!” it was hard NOT to try and catch some air. My aerial skills are sub-elementary, but I managed to get both tires off the ground to the mild-amusement of the crowd. Josh and I battled on over the barriers and past the pits, before we exited the course together. I was frustrated to finish in 51st position. For one, I really liked the course and I felt like it was a track where I could excel. Second, I had an expectation that the week of training in Nice would be good for the legs and for the mind. That was not necessarily the case. 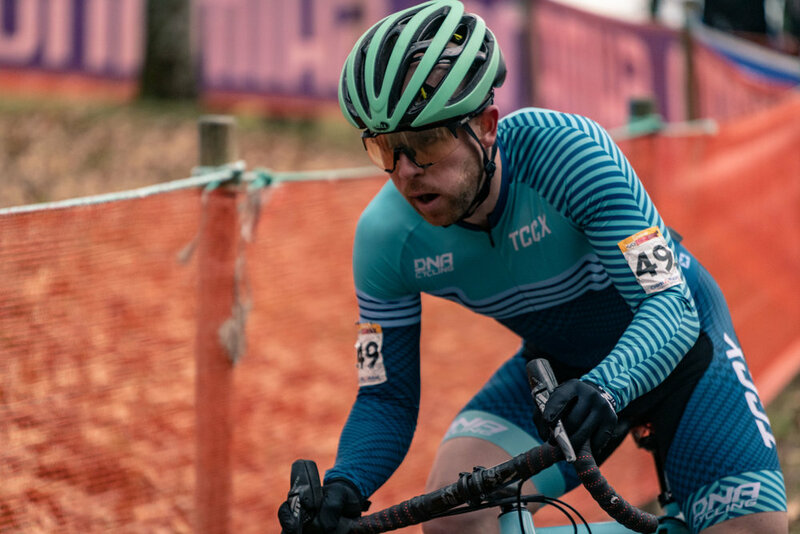 While the training was good, the long slow miles did little to prepare me for the rigors of a European World Cup and my handling was a bit rusty. Could training with a season that has already been intense, and I find myself being set up for disappointment. By no means do I feel like I should be at the front of the race, but I have leveled up this year and I have created expectations around that. To go from racing towards the front of the race in the US to being at the back of Every. Single. Race. is a really hard shift to make mentally. For me, that has been the biggest revelation of this European campaign. At home, I’m pretty good and I know where I am at in the pecking order. But it took just a few races in Europe of getting my teeth kicked in to realize that I’m not there yet. If I’m honest with myself, I’ve let off the gas a little bit. Starting the season with some Top 5 results and gaining more street cred at home put me at ease. I felt like the process of racing in Europe would come easy and the results would reflect my domestic success. But reality hit in Namur (and the whole Kersteperiode) and I’ve been working to find my mojo ever since. As we drove back to Belgium from Pontchateau, I had lots of quiet time to think and reflect on what I’ve been through so far. The peaks and valleys of a racing season are many, but it is the constant ebb and flow that forges us into the competitors we are. The chapter of the 2018-19 season is not yet finished, but there are just a few pages remaining. Time to get back to work and right the ship.